Colovore has run out of space in the first phase of its 20kW-per rack data center; next phase will be 35kW per rack. Not everybody needs a high-density data center to host their equipment, but if you do, options are limited if you want to outsource to a colocation provider. While you can find a provider that will design a custom environment to support your load (if your deployment is big enough), that’s not exactly the same as simply leasing a rack in a colo, and certainly much more expensive. Predictions about a decade or so ago that data center power densities would skyrocket across the board turned out to be mostly wrong, and colocation companies have designed their facilities accordingly. Densities have remained steady in most cases, but some workloads have emerged that require the kind of power-per-rack that’s usually reserved for supercomputers. The high-density data center as a service has become a niche market, and some companies have emerged to fill it. One such company is Colovore, which launched its first data center – located in the midst of one of Silicon Valley’s biggest data center clusters in Santa Clara, at 1101 Space Park Drive – in 2014. Today, with the first 2MW phase of the facility fully occupied by clients, the company is building out Phase Two, expecting at least a portion of it to go to existing customers. 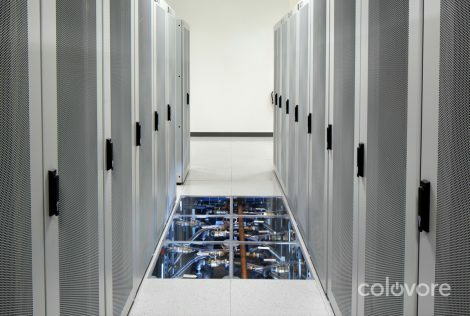 The workloads that require Colovore’s 20kW to 35kW per rack include machine learning, bioinformatics, rendering for applications used to operate autonomous cars, and private cloud, Sean Holzknecht, the company’s president and co-founder, said in an interview with Data Center Knowledge. GPU clusters running software for machine learning occupy a large percentage of the facility, he said. Such GPU clusters are currently the best available architecture for training machine learning algorithms and require high power density from the data centers that house them. As another example, a company called Cirrascale has geared its data center outside of San Diego specifically for machine learning, and densities in the facility reach north of 30kW per rack. Colovore founders started by examining the biggest headaches IT departments working in colocation data centers have. One of the common problems they saw was people trying to solve density issues by doing things like spreading fewer servers among many racks. That’s what lead them to bet on high density, Holzknecht recalled. So far, the bet has paid off. One of the reason’s Colovore’s model works is its location, he said. Many of the companies pushing the envelope with machine learning, cloud, and self-driving cars are located in Silicon Valley and ready to pay for high-density data center space to house their gear because designing and operating such facilities in-house is complicated and expensive. The company uses rear-door heat exchangers to cool its high-density racks. First phase of the facility is designed for 20kW per rack, while the second one will be 35kW per rack, using the same cooling distribution design but with rear-door heat exchangers rated for 35kW per rack instead of 20kW. The data center has a raised floor, but it’s not used to deliver cold air to the IT equipment. Instead, underneath the raised floor is a custom system of water pipes and pumps to deliver cold water to the heat exchangers. The system had to be custom-designed because the typical off-the-shelf rear-door heat exchanger solution doesn’t provide much more than 200kW of total cooling capacity, Holzknecht said. At warehouse scale, those stock water supply units will take up more space than server cabinets. Getting from 20kW to 35kW is simply a matter of supplying more gallons of chilled water per minute and setting a lower supply temperature on the water delivery loop. Another common problem of IT staff working in colocation facilities Colovore set out to address is colocation staff who do not understand IT. The data center services industry grew out of commercial real estate and telecoms industries, neither of which has a history of collaborating with IT, Holzknecht, who’s worked for various data center providers for about 17 years, said. Sysadmins and engineers working inside colocation facilities are used to a “take it or leave it mentality” in many of the workers that staff colo facilities. It’s common, for example, to have a security guard working for an outsourcer running reception and being the first person that greets you when you arrive at a colo. If you’re an IT person with critical infrastructure in the facility and in a “hair on fire” situation, you need to speak with somebody who can help you as soon as possible, and chances are that security guard is not going to understand what your problem is exactly. To be sure, Colovore’s security team does not do IT, but they’re not the first point of contact for customers, Holzknecht said. Customers are greeted by people who speak their language. With second 2MW phase under construction and room for two more similar phases, next on the agenda for Colovore is adding more sites. The long-term plan is to have at least three data centers in the San Francisco Bay Area and one outside for disaster recovery. “The plan all along was to grow out of the Bay Area,” Holzknecht said.